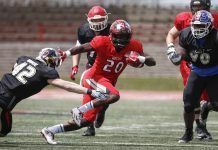 With the 2-0 Heat loss at home to Saskatchewan the Huskies have cemented home field advantage for the first round of postseason play with their fourth shutout of the season. Final home game Sunday 1 p.m. for UBCO. 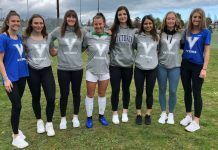 KELOWNA, BC — UBC Okanagan lost their second to last regular season game at Nonis Sports Field to the visiting University of Saskatchewan Huskies on Saturday, October 22 as Heat women’s soccer team was blanked (2-0) by their prairie foe. Both teams had already clinched a playoff spot before this weekend, but the Huskies were tied for second place in the Prairie division and so were playing to cement home field advantage come the first round of the postseason. The first half on Saturday saw no scoring, although the Saskatchewan attack forced Heat keeper Chloe Ainsworth to make a number of saves in the first 45 minutes. Erica Hindmarsh (fifth year midfielder), Rebecca Weckworth (fourth year midfielder), and Jackson Wiegers (second year midfielder) combined to put five shots on goal for the Huskies, all of which were stopped by Ainsworth. 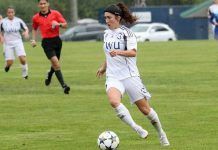 Weckworth would be the only player to score in the match, as the speedy midfielder netted her fourth and fifth goals of the season in the second half. The first goal of the match came in the 49th minute when fourth year Huskies striker Leesa Eggum fed a free kick to Weckworth, who was able to get to the ball in a scrum just inside the 18-yard box and put it into the bottom right corner despite a big collision with Chloe Ainsworth. Ainsworth was subbed out as a result of the collision, and was replaced by first year Heat keeper Caralina Serrano. Weckworth’s second goal of the match came in the 67th minute on an assist from fourth year defender Jennifer Miller. Miller fed a pass into the top of the box, and Weckworth was able to beat Serrano with a low shot on her left, once again putting the ball in the bottom right corner of the net. The Heat also had their best chances in the second half, the closest being a pair of shots that went off the left post of the Huskies goal. The first chance to go off the post came in the 62nd minute, when first year Heat midfielder Kylee Walker had a run up the left side and put a nearly perfect chip shot past fourth year Huskies keeper Kyleigh Vause that would have been a goal had it been half a foot to the right. The second ball off of that same post for the Heat came in the 73rd minute. Second year defender Ally Ferronato put a free kick into the box, and in a crowd first year defender Violet Bacon was able to get her head on it. The shot went off the post, and Vause was able to pull it in before the Heat could capitalize on the rebound. In the first half Maddy Laranjo had an shot at putting the Heat on the board as she got a toe on a cross but the deflection sailed wide right. Saskatchewan named Rebecca Weckworth their MVP for the match, and UBC Okanagan gave their MVP award to Maddy Laranjo. After Saturday’s contest, the Huskies now hold a conference record of 7-3-3 and remain tied for second place in the Prairie division standing, as MacEwan also won their game Saturday and are also 7-3-3. The win also guarantees Saskatchewan home field advantage in the first round of the playoffs, as the rest of the division below them each have 3 wins with one game remaining. UBC Okanagan now hold a record of 4-8-1, and will stay in sixth place in the Pacific division. In the first round of the playoffs, they will travel to Langley to play Trinity Western who have locked up the top spot in the division with an undefeated record of 11-0-2 with one game remaining. 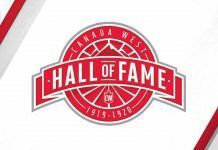 Saskatchewan (7-3-3) will play their final regular season game Sunday, October 23 when they travel to Kamloops to play the Thompson Rivers WolfPack (1-11). UBC Okanagan (4-8-1) will play their final match of the season on Sunday as well, when they host the University of Regina Cougars (4-6-3). HEAT NOTES: Prior to the kickoff of Sunday’s match the Heat will say goodbye and thank their two graduating senior players, Devon Fleming sand Katie Smillie.